Going cake crazy for Macmillan! CFT have once again come together to raise funds for fellow charity Macmillan Cancer Support. 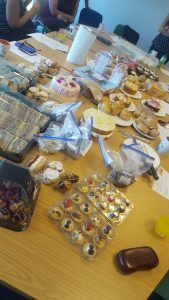 Our North East Team baking up a storm! 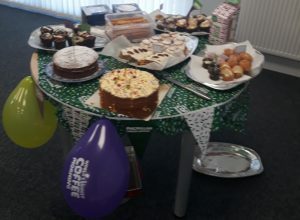 2018 saw the return of the nation’s favourite coffee morning and CFT embraced the spirit by holding coffee meeting’s at each of our regional offices throughout the UK. 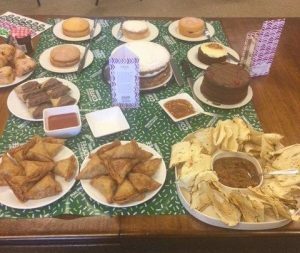 Combining our coffee mornings with our Foster Carer Team Meetings at various points in September, the event saw staff and foster carers come together to indulge in some sweet treats and have a good catch up while raising money for a good cause. We are thrilled to announce that across the regions we managed to raise £288.30 for Macmillan. Thank you to everyone who came along, supported and donated to these events, once again they were a huge success! To find out more about Macmillan, the work they do and how to donate, please visit their website. The Midlands got creative with a pairing of indian treats and cake!